All-on-4 is an innovative dental implant system available at City Dental in Leeds, which utilises advanced technology to support entire arches of teeth using just four dental implants. 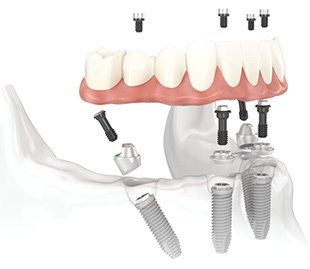 Dental implants are titanium screws that are placed into pre-drilled openings in the bone tissue of the jaw to replace the root portion of a missing tooth. It is possible for dental implants to support a single crown, a dental bridge or a set of dentures. Normally, between six and ten implants are needed to support an arch, but the All-on-4 system requires just 4 implants to support an arch. All-on-4 works by placing the implants at specific angles to maximise anchorage and support. 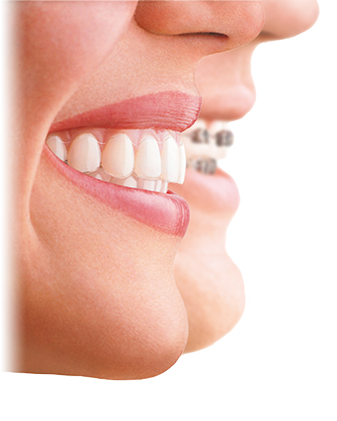 To take advantage of the strong bone tissue at the front of the mouth, two dental implants are inserted at the front of the mouth and two other dental implants are inserted at the back of the mouth at a 45 degree angle. It is the specific angling of the implants which ensures function and stability. Unlike traditional dental implants, the procedure to fit All-on-4 dental implants can be performed and completed in just one day; ergo the reason for their other names, Same Day Teeth and Same Day Smiles. Dental implants usually take a while to integrate into the bone and it is necessary for temporary restorations to be fitted while the gums heal and the implant settles. With All-on-4 implants the new restoration can be fitted on the same day, meaning there is no need for short-term restorations or repeat visits. All-on-4 implants create beautiful smiles and restore full function to the mouth, so you can benefit from a glowing set of pearly whites and never have to be anxious about loose dentures or gaps in your smile. The procedure involves your dentist making small incisions in the gum tissue and lifting the tissue to drill small holes in the jawbone. It is these holes which act as sockets for the implants. Your dentist will then screw the implants into the sockets at specific angles, fix them in place and, once this has been done, a new restoration can be attached. Some people may worry about only having 4 dental implants to support an entire arch, but the treatment has been around for some time now and the results have been extremely positive.